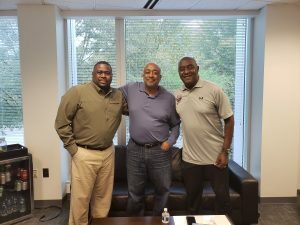 Two entrepreneurs, one from Alabama and the other from Mississippi, both migrated to NC to pursue Information Technology careers at Fortune 500 companies. Their paths crossed years ago at a cigar shop in Durham, North Carolina, and they’ve been friends ever since. Currently, Reese & K-Mac have the only African-American owned morning drive, sports talk show in the country. In this episode of Hustle Unlimited, Donald sits down with Reese & K-Mac to talk about leadership lessons learned from growing up in the South and advice they have for aspiring entrepreneurs.